Facing the wrath of a great civilization. : Shri Krishna and the 16000 wives !!! Well, I think most of us accept the fact that He did have 16,000 wives and henceforth the question "Polygamy in Indian Culture(Hinduism)". I recently came across a you tube video where a woman asks Mr. Zakir Naik, why Islam encourages polygamy for which he explains that Quran is the only book that supports one woman man for which I do not have a contradict. Good if it says so. But then he also says that there is nothing in wrong in having more than one wives and gives so many stupid examples which I will bring in the later part of this article. The question was raised by a Hindu woman. He has to convince her that only Islam is right and there he takes the example of Lord Shri Krishna for which the woman had nothing to say further. To talk about Dr. Zakir Naik, I would say that he is unlike the normal muslims in India and he is among those who's existence is a threat to the entire world and to the Islam itself for his goal is to convert and not follow. He need numbers, he want to change the names. He proclaims himself as an encyclopedia of Vedic texts and claims that Vedas has been interpreted and the corrected form is the Quran. He already have so many haters in Islam. I had only one question for him, if I were ready to join Islam, out of the 72 sects which sect should I be joining for all have a vast difference in the beliefs. And any person should be given the right to believe and not he should forced to be believed. Mr Zakir Naik and company does the later. I'm not religious. I'm spiritual. And being spiritual is the ultimate goal of the so called Hinduism though the Hindu word does not make any sense to me. My focus is to explain to the woman and to those like her about the Shri Krishna his 16000 wives. Lord Shri Krishna was wedded to none except Rukmini. The myth of 16000 wives came from a story where he liberated 16000 captive girls from Narkasur. The story itself is questionable. Further the story never states that Krishna married 16000 girls. It says he protected them, which is true if story is correct. had Krishna married 16000 of them, it would have taken him more than 10 years even at rate of 4 marriages a day as per the prevailing rituals! Krishna was so strictly disciplined that he observed complete Brahmacharya for 12 years before planning to be a father. That is why Krishna is such a role model for entire society. The narrator of Geeta had no time for anything except nation-building in those testing periods. 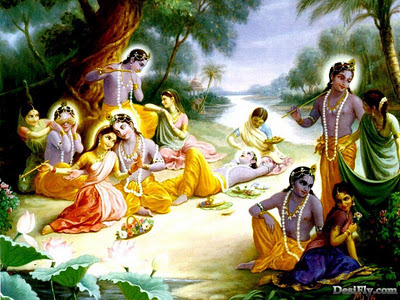 Krishna never had any love-games with any Gopi. These are figments of imaginations which got popular during dark age of foreign rule when rulers of small states indulged in wasteful enjoyments after accepting supremacy of foreign rulers. Further the whole story of Radha is a figment of imagination. It exists only in Brahma Vaivart Puran which is another unscrupulous book like Bhavishya Puran that insults legends like Krishna and Ram. The concept of Radha grew popular only in very recent times during dark age of India when rulers of princely states were busy only in considering themselves Krishna incarnate and indulging into lustful activities by demeaning just a legendary Brahmachari character! Mahabharat does not contain these. Please read this excellent article by Dr Satya Pal Singh, Police Commissioner of Police, Pune: Lord Krishna – Lord Krishna – an enlightening personality. While polygamy was practiced by certain rulers at various points in time, it was restricted only to ruling class and never became a mainstream in larger population. That is why Hindus had no discomfort or objection to formal introduction of monogamy as a law after independence. All the great legends of Hinduism, whom many consider to be near God, were purely monogamous or brahmachari- Vishnu, Shankar, Ram, Lakshman, Bharat, Shatrughna, Hanuman and Krishna. Thus it is a gross myth that Hinduism accepts Polygamy. On contrary, Vedas are unambiguous over recommendation of monogamy alone. The same has been the trend for general population and our role models. If there is any philosophy that condemns polygamy and specifically demands monogamy, it is the Hindu Dharma based on noble precepts of Vedas. Dr. Zakir Naik says – Average life span of women is more than that of men. By this logic, polyandry (one wife- multiple husband) should be allowed. Because, on average, one wife would require more than 1 husband to cover her entire life! Dr. Zakir Naik says – World female population is more than world male population. This contradicts previous point. If one looks at 2008 data of World Population as published by UN Statistics Division, there are 2% more males than females in the world! The same is also true for marriageable age discarding children and elders. Does he recommend Polyandry now? The table has facility to sort by fields. What we observe is that the top 9 countries with more men than women are all Muslim countries. Stricter the Islamic Law, more adverse the gender ratio. There are 2.74 times more men in UAE and 2.46 times in Qatar. India and Pakistan are also is not far off with their significant Muslim population! Dr. Zakir Naik says – Muslim women in due faith could bear a small personal loss to prevent a greater loss of letting other Muslim sisters becoming "public properties". We just saw the data above. Does Dr Naik recommend the inverse now? In civilized societies like Vedic Dharma, each women apart from one' s wife is viewed as mother, by default. The basic rule is “Matrivat Paradaareshu – All except wife are like my mother”. That is why the question of someone becoming public property does not arise. In wars, legends like Shivaji would bow to imprisoned women and call them mother! And in a society that respects women, the question of adverse gender ratio does not arise as is happening in conservative Muslim countries. What is important is use of word “property” for women. Dr Naik recommends that polygamy enables women to be private property rather than “public property” at small personal loss. This small loss is a great insult to entire womanhood. If sharing of husbands is haram, why is sharing of wife merely a small personal loss? Vedas do not discriminate at all between men and women and provide them equal rights and privileges in all matters including marriage. a. This will help identify father of the child! b. Man by nature is more polygamous! c. It is biologically difficult for women to be polyandrous and rear children! d. High chance of acquiring sexual disease! > Woman cannot stay virgin. > Woman will be raped, someday or the other. > A woman will never die virgin. > And later she will become a prostitute. What make me pissed of is not about what this idiot speaks. It is the appreciation that he gets for these comments makes me feel ugly about these people. Are they so idiots? The problem with these men is that most of them are SADISTS. And thats the truth. Wise can decide themselves the mentality of this admirer of Osama bin Laden. And I have heard him lot many times praising Osama bin Laden. In summary, Polygamy is a malpractice, quite aptly condemned by the Vedas. Hinduism guided by Vedas and its role models has always emphasized on monogamy and self-control as the only way for humans. Efforts to justify polygamy, through whatever reasons, is an insult to entire womanhood. May such deviant minds introspect and come into the shade of Vedas. May they inculcate feeling of respect for entire Matru-Shakti. I agree with you, love your posts.. I don't endorse polygamy. But your rendering of Krishna's 16000 wives is rather disappointing in the sense that while accepting one work(Mahabharata) of the same author(Veda-Vyasa) you dramatically reject the other(Bhagvata Purana.) Bhagvata Purana is considered by learned persons as 'the fifth Veda.' Chaitanya Mahaprabhu called it 'a spotless purana.' The authenticity of Bhagvata Purana is beyond questioning in my humble opinion. Kindly Read it again... Its "Bhavishya Puran"... and NOT "BHAGVATA PURAN"
1) You yourself saying the story is not correct about Krishna specially regarding his wives… that means you agree Mahabharata has been changed with passage of time? 5) Why are you after Dr. Zakir Naik? He talks about religions on grounds of their religious scriptures. You also prove him wrong with examples from Hindu or any other scriptures or even from Quran. But you are not able to do so, thus you throw out your own views and theories. 6) What civilized societies??? Your Hindu ministers are having multiple wives. Why 12 Hindus are rapping one signle female, their own mother as mentioned by you? Please don’t use your own logics or views as everybody has his own view point. That’s the reason nobody is coming to a common platform. Prove things using authentic religious scriptures. What you say or I is not important at all. 7) Public or Private… Woman is no one’s property but only God’s (Allah’s). Islam also allows you to marry a 2nd one when you can do justice b/w them as you Veda says brother. 8) Regarding DNA testing, one how many countries have this facility, 2nd how many people can afford it, whatever you do female all together in the world is more than the male, so you are out on this..!! 9) Are you a medical dr. that you so this is incorrect or that is wrong. If you are right, bring some medical proof. 10) If you are so pissed off, why don’t you challenge Dr. Zakir Naik in public and let’s see who is right and whose wrong? 11) And at last… read your whole text again and see yourself… who has a sick mind… a modest person will never abuse… even if the other person is wrong rather he will use his logic and sorry brother you are not using logic but abusive language..!! Krishna's activities should not be seen LIKE OURS in a material angle! They are all in Spritual platform to satisfy His devotees! A year back. A nun in Warsaw, Poland, filed a case against ISKCON (International Society for Krishna Consciousness). The case came up in court. The nun remarked that ISKCON was spreading its activities and gaining followers in Poland. She wanted ISKCON to be banned because its followers were glorifying a character called 'Krishna', "who had loose morals," having married to 16,000 women called Gopikas. The ISKCON lawer argued to the Judge: "Please ask the nun to repeat the oath she took when she was ordained as a nun." The Judge asked the nun to recite the oath loudly. She did not. The ISKCON lawyer asked whether he could read out the oath for the nun. "Go ahead", said the judge. The oath said in effect that "She (the nun) is married to Jesus Christ". The ISKCON lawyer said, "Your Lordship! Lord Krishna is alleged to have 'married' 16,000 women only. There are more than a million nuns who assert that they are married to Jesus Christ. Between the two, ie, Krishna and Jesus Christ, who has more wives?" The case was dismissed and the ISKCON people won it! This incident shows that people need religious tolerance in a society! NOTE: JESUS CHRIST AND ALL OTHER GREAT SOULS ARE RESPECTABLE AS THEY FOUGHT FOR SPREADING THE MESSAGE OF GOD. THIS INCIDENT MUST BE TAKEN TO SHOW THAT THERE SHOULD BE NO HATRED BETWEEN VARIOUS SPRITUAL PRACTICES AND ALL SHOULD LIVE IN HARMONY!